Sorry I haven't written in a few days. What a "Situation." I got in a little bit of a jam when I decided to show up in Cleveland for the Yankees series with my brand-new LeBron James Miami Heat jersey. For some strange reason, fans didn't really handle it well, and they ran me out of the stadium. The nerve! One other thought - notice how Cleveland third baseman Andy Marte shut the Yankees down in the ninth? The Yankees just can't hit against pitchers they've never seen before, even if the pitchers are really position players! South Florida sports radio host Larry Milian has a new gig. He and Miami Herald sports columnist Armando Salguero are going to be hosting a new morning drive time show for WFTL Sports in Fort Lauderdale. The Miami Herald wrote about it today. It's called "Armando and the Amigo," and it will be on at 640 on your AM dial, if you're in the Miami/Ft. Lauderdale South Florida area. You can also listen live starting this Monday morning by going to the WFTL website. Anyhow, I'm very excited for Larry's new job. He first interviewed me in 2006, and I've been on his show dozens of times since. Squawker Jon and I also met Larry when he came to New York two years ago, and he's just as cool a guy in person as he is on the air. Congrats, Larry and Armando! After the Mets rallied from six runs down Wednesday night only to lose in 13 innings, David Wright noted that "moral victories don't count in the standings." I wouldn't anyone on the Mets to feel any other way, but I did get some satisfaction out of the comeback, because it's not as if the Mets are making the playoffs this year. A couple of days ago, reader Jonmouk71 wrote that the Mets would have to go 40-23 the rest of the way to win 90 games, and even if 90 wins got the wild card, the Giants would only have to be around .500 the rest of the year to get there. Two days later, the situation is only getting worse. The Mets are tied for fifth in the wild card race, 6 1/2 games behind the Giants, five games behind the Reds and four games behind the Phillies, who look like they are about to get Roy Oswalt. So even if the Mets go on a hot streak the rest of the season, they need to have all of the main contenders struggle, which is extremely unlikely. No, it's not to exciting to root for the Mets to finish above .500 and ahead of the Marlins, but winning 85 games would still exceed most people's expectations at the start of the year and provide hope for next year. Just not too much hope, since Omar Minaya and Jerry Manuel still need to go after the season. What's the deal with all those freak baseball injuries? There have been a lot of weird injuries this year, from pie-throwing mishaps to sneezes gone bad. I wrote a piece for The Faster Times about the issue. Please check it out. Daily News columnist John Harper has come up with the best short-term solution to the Mets' woes - get rid of Oliver Perez now. I have been opposed to this idea but I have come around. I didn't like the prospect that Ollie's agent Scott Boras could be conspiring to force the Mets to set Perez free so that he could sign with the Yankees or Phillies and suddenly regain his form. Ollie has pitched well in both ballparks. Plenty of teams will be willing to gamble the minimum on Perez, who is still young and appears to be healthy (physically at least). But as Harper points out, Perez is throwing only 86 mph and "still doesn't know where the ball is going." A few years ago, the Yankees thought they were being clever when they took Armando Benitez off of the Mets' hands. But they got rid of Benitez just three weeks later. Squawker Lisa, one advantage of the Yankees getting Ollie is that Joba Chamberlain and A.J. Burnett would no longer have to worry about being the biggest head case on the team. As Harper notes, dumping Ollie now would send a positive message to the team that they "really do want to win." It would also send the same message to the fans, who have some reason to doubt it. Just as in the offseason, the Mets are not taking on payroll after saying they would. Bengie Molina and Joel Pineiro were supposedly not worth it. With Molina, the Mets went for a much cheaper option in Rod Barajas, which looked like a good move in May, but now, not so much. With Pineiro and all the other available pitchers, the Mets tried to say with a straight face that they were no improvement over the likes of Ollie and John Maine. Actually, I'm more concerned with the Mets giving away prospects for the likes of Ted Lilly than whether or not they take on payroll. After Cliff Lee and Dan Haren, there's not much more that is worth either prospects or payroll. But perhaps the best thing about eating the rest of Ollie's contract is that it would set a badly-needed precedent. Right now, Luis Castillo is the Mets' best option at second base. But wouldn't it be great if this offseason, the Mets were willing to eat the remainder of Castillo's contract, which will only have a year to run, and finally upgrade the position? That would be something to look forward to - along with upgrades at manager and GM. The Grandy Man Can! Curtis Granderson has hit three homers in the past two days, and his two-run homer Monday night, combined with Javier Vazquez's great pitching, helped the Yankees win. I'm glad to see that Granderson is finally hitting - he's .427 in his last six games. The center fielder is an easy guy to root for, between his engaging personality, and all the charity work that he does. Grandy is also a fellow blogger, so how could I not like him! Granderson was one of Brian Cashman's big acquisitions this winter; Javier Vazquez was the other one. And Javy struggled so much in the first month of the year that he looked like Cashman's Folly. But since then, his ERA has dropped over five runs, and he's pitched more like the Atlanta Braves ace he was last year, and not the hurler Yankee fans remember from October 2004. Anyhow, Granderson and Vazquez were the two big heroes of the night. But strangely enough, the New York Post didn't see fit to mention either of them on today's back page. Instead, with their cynical "Who Needs 'Em!" headline, Joba Chamberlain and Alex Rodriguez are lumped together as the forces of evil in Yankeeland. See why I complain about the media! Maybe the Post is just mad that four hours after a headline on a George King blog entry claimed that "Girardi says he is sticking with Joba," Girardi went to Dave Robertson and Boone Logan instead! As for Joba, I think Girardi is doing the right thing in trying something different. If Joba name were Joe Blow, and not Joba Chamberlain, he would have been demoted a long time ago. A-Rod, of course, did not hit #600, but he did appear to have a lot of Yankee fans in the house cheering him on. I squawked a lot yesterday about Yankee attendance. As Squawker reader Peggy noted, the Indians have the worst attendance in the majors, averaging around 16K a game. For what it's worth, last night's attendance was 27,224, which ranks third for Cleveland's home game attendance, after Opening Day and Stephen Strasburg's second major league game. Are you concerned about Joba Chamberlain? I was a guest on my friend Larry Milian's radio show last Saturday on South Florida radio station WFTL before Old Timers' Day. He also had on CBS-era pitcher Stan Bahnsen on during the same time, so I got the honor of talking baseball with Stan. Here's very knowledgeable on past and present Yankee history, as well as pitching. Anyhow, we were talking about Joba Chamberlain, and what to do on him. The subject of whether he needed to be sent to the minors came up, with us talking about how doing so has made others straighten up. Anyhow, it was a very interesting discussion. I mentioned about how miserable it was to watch his starts last year - they were so slow-paced - and how I wanted him in the bullpen as time went on. But how he hasn't been the Joba of old in the pen. It's now a week and a half after this talk. And Joba, who his own peers voted as "Most Overrated" player, got booed by Yankee fans yesterday after giving up that homer to Scott Podsednik. He also was mentioned as being part of a possible Dan Haren trade. And Joe Girardi is still making noise about replacing Chamberlain with Dave Robertson in the eighth inning. So I'm wondering what readers are thinking. Are you sick of Joba? Do you want him off the team, or in the minors? Do you want him as a starter again? Personally, I wouldn't be averse to him being sent to the minors, but even then, I don't know if that will solve him. It's all just a mess. In my blog entry about how Yankee fans are more interested in A-Rod hitting 600 than the media says, I noted that the Yankees-Royals series this weekend had more attendance per game than any series this year except for the Mets and Red Sox. Personally, I don't think all those people were there to see A-Rod's 600th. I think a lot of them were there because the Royals stink, so there would be more tickets available and this would be their chance to see the Yankees without blowing even more of the budget on a scalper. Maybe they love A-Rod, but no more so than they love some of the others, and Number 600, if it comes while said fans are there, will just be a bonus. All of these games were marquee events. There's a reason that two of the Kansas City games cracked the top 10 for the year, and it has nothing to do with fans looking for a bargain. If fans were merely looking for a bargain, you would probably see some Orioles games as well. But the Yankee home games against the Orioles are actually the worst attended. As for the notion that fans were going this weekend because "this would be their chance to see the Yankees without blowing even more of the budget on a scalper," ticket prices were actually higher on the secondary market than they would normally be for a Royals series. So much for nobody caring about A-Rod hitting 600, eh? A big portion of the Yankee Stadium crowd at Sunday's Yankees-Royals game stayed through a two-and-a-half hour rain delay just to see Alex Rodriguez get the chance to hit his 600th home run. They also stayed through a virtual monsoon Friday night, and brutally hot weather all weekend long, just to watch A-Rod. But, but, I thought none of the fans cared about this quest? I thought everybody hated A-Rod? At least that's what all too many people in the media have tried to tell about us over the past week. ESPN New York's Johnette Howard was one of the many writers who insisted insisted that A-Rod's "countdown to 600 home runs is barely registering in the public's imagination, even here in the Big Apple." Associated Press sportswriter Tim Dahlberg called it "joyless occasion." Those are just two of the many, many articles written in the past week about how nobody cares about 600. Interestingly, for an event the media also professes to have no interest in about, they write about it an awful lot, don't they? There's a real disconnect between 1) the media telling us fans how we just don't feel anything about A-Rod going for 600, and 2) the fact that nearly 150,000 fans showed up this weekend to see these games. The Friday, Saturday, and Sunday games were some of the top-attended games of the season; the only games this year that drew more people were the Red Sox and Mets series and Opening Day. Yet even despite all that, we still hear the same old story about how none of us care. The otherwise sensible Scott Miller, CBS Sports columnist, wrote Sunday that "as A-Rod takes aim, one of the remarkable things about it is how little buzz has surrounded his chase at 600. Sunday, it was completely eclipsed by a Hall of Fame class that included umpire Doug Harvey, legendary manager Whitey Herzog, and Dawson." Oh, really? Then why is Miller's story about the Hall of Fame induction mostly about, um, A-Rod? Some eclipse! Maybe it's reporters' solipsism; they think because they don't like A-Rod, nobody does. Maybe it's their groupthink mentality. But it's amazing how many of them are fixated on the notion that all Yankee fans hate A-Rod and have no interest in watching him reach 600 homers, even when there's tons of evidence to the contrary, like people sitting through interminable rain delays just to see him hit. Good grief. I'm writing this while watching tonight's game, as Alex Rodriguez goes after his 600th home run. But a lot of reporters have been denigrating the chase, partly because of A-Rod's admitted steroid use, partly because they just don't like the guy, and partly because bashing A-Rod sells papers. I can totally understand and respect if somebody doesn't think this pursuit is anything worth discussing due to A-Rod being an admitted PED user. That's the price A-Rod has to pay for juicing - that any record he achieves now is tainted. I'm okay if some Yankee fans don't want to get excited about this. But that means that reporters and fans have to hold the same standard with any other player caught using PEDS as well. Even when it's a beloved figure like Andy Pettitte. Now, don't get me wrong here - I'm not trying to bash Andy here. He was - and is - one of my favorite Yankees. Just saying that they should be treated the same way on the same issue. You may remember that Andy got his 200th win as a Yankee last month. The New York Post, New York Daily News, Newark Star-Ledger, and The Associated Press, among others wrote about it, but none of them mentioned Pettitte's admitted use of HGH as a Yankees. Nobody speculated how many of those wins might have been fraudulently obtained. In a web search tonight, I could only find one article about Pettitte's 200th win which even mentioned Pettitte's HGH use. It was from Wallace Matthews of ESPN, who said those three letters would keep Pettitte from voting him into the Hall of Fame. Oddly, though, most of the rest of the column was about how A-Rod was selfish in somehow letting his aching hip overshadow Pettitte's night. If you're going to hold A-Rod's steroid use against him, you have to do the same for Pettitte's HGH. And for David Ortiz. And for Manny Ramirez. And for anybody else out there who's been caught. Don't just put that scarlet syringe on Rodriguez. Even if it will help you sell a few papers. In 2006, Omar Minaya dealt starting rightfielder Xavier Nady at the trade deadline in a panic move to find a replacement for injured Duaner Sanchez. Now there are reports that the upcoming trade deadline may see the Mets move the player who has been their starting rightfielder most of this year, Jeff Francoeur. Depending on what the Mets can get in return, it could be another panic move. A month ago, Francoeur was seen as one of the main reasons the Mets had better chemistry than they had had in years. His arm contributed to the Mets being much stronger defensively, which has help the pitching staff exceed expectations. Francoeur has been up and down at the plate, but he did bat .310 with an .801 OPS in June, when the Mets were winning their way into contention. Once Carlos Beltran returned, the Mets had four outfielders for three spots. Angel Pagan was having the best season, by a wide margin, but Jerry Manuel decided to go by past performance and salary and initially reduced Pagan to a platoon role with Francoeur. Manuel also installed Beltran in center field, despite his bulky knee brace and the fact that Pagan was doing a great job in center, and batted Beltran cleanup even though he had been out for a full year. Last year, when Billy Wagner returned after being sidelined for a long time, he was eased back into action, not thrown right back into the closer role. This year, Wagner has returned to being one of the best closers in baseball. A healthy Carlos Beltran playing up to his great ability could be the best player on the Mets. I hope Beltran regains that form as soon as possible. But until he does, he should be playing right field and batting fifth or sixth. Jason Bay's first half was far from a complete disaster, except for the lack of power. He hit .275 with an OPS of .801 through June 30. But in July, Bay is batting .169 in July with an OPS of .466. Francoeur's July has been even worse - .114 batting average with a .329 OPS. Right now, both Bay and Francoeur deserve to be losing playing time. And Beltran should be easing his way back to fulltime duty. The Mets should be rotating all three, giving each of them a couple of days off each week, while hoping that one of them catches fire. In the long run, Bay is a much better player than Francoeur. But this season, Francoeur has had a couple of hot streaks, while Bay has had none. In 2010, is Bay any more likely to go on a hot streak than Francoeur? Even if Francoeur ends up on the bench, the Mets could use the outfield depth. Beltran is just back from a serious injury. Before this season, Pagan was very injury-prone. Bay is over 30. If someone gets hurt and there's no Francoeur, do you really want to see Chris Carter playing fulltime (so much for defense) or Jesus Feliciano called back up? As for chemistry, that's not enough to keep Francoeur on the team if he is not producing on the field. And maybe his chemistry isn't so great when he's on the bench. Alex Cora is supposed to bring chemistry, but that doesn't mean the Mets are better off with him in the lineup. Likewise, if Beltran and Castillo produce, that will be all the chemistry they need. Maybe what's messing with chemistry is the Mets' unwillingness to play players based on merit, going back to the beginning of the year, when John Maine and Oliver Perez were in the rotation and Mike Jacobs and Gary Matthews Jr. were in the starting lineup. Now Beltran is hitting cleanup and playing center, Ollie is back on the team, Francoeur could be traded, and the most people think the Mets's biggest problem is pitching when the team can't hit. Trading Francoeur for a mediocre starter could make the team worse. At least the Mets kept Josh Thole - now they just have to get back to having two catchers like most other teams. As for rumors that Manuel's job is in jeopardy, someone should take the fall for all the strange decisions going on with this team. But are they Manuel's alone, or is someone telling him to play the high-priced players whether or not they are productive? I was reading articles about former Yankees manager Ralph Houk, who died yesterday. My brother described Houk as the first manager he ever saw. Anyhow, I was starting to write a piece on Houk's life, then it occurred to me to check out Squawker reader Uncle Mike's blog, as he might have already done so. And sure enough, he wrote an article on Houk's life that is really terrific. Mike really knows his Yankee history! Here are some tidbits on Ralph Houk, courtesy of our reader (you can read the entire piece at Uncle Mike's Musings, which I would encourage you to do. Read the whole article at Uncle Mike's blog - it's worth the trip over there. So much for Tim McCarver's claim that the Joe Torre has been airbrushed from Yankee Stadium. The FOX broadcaster told listeners Saturday that there's "no sign of Joe Torre at the stadium." But TV personality Keith Olbermann, went around Yankee Stadium the other day and counted 21 pictures of Torre, both outside and inside the ballpark. (Go to his Baseball Nerd blog to see some of the images.) There is even a luxury suite number 6, featuring pix of the last man to wear #6 - Torre. I appreciate that Olbermann took the time to set the record straight with some photo evidence, something no NY paper tried to do. I'm a fan and friend of Tim McCarver's, and Joe Torre is my oldest baseball friend. I've even worked with them both. And I know the Yankees could have done better by Joe, and his exit was unceremonious and poorly-handled by the club. I would also argue that the Yankees are the most self-important, overly-serious franchise in overtly pro sports (I can think of about 27 college programs that would at least give them a run for their money). But Timmy was just wrong, in style and in substance. Neither literally nor figuratively have the Yankees excised, erased, airbrushed nor Memory-Hole'd Joe Torre. Doubtless the day will come soon, perhaps even while he's still managing elsewhere, that they will formally retire the number and give him the big ceremony he deserves. To see a conspiracy in the fact that the day has yet to come is, at best, to overreact. My Subway Squawkers piece on Tim McCarver's comparing the Yankees front office to Nazis and Communists was the most popular thing I've ever written for this blog. It struck a nerve with a lot of fans, and was featured and linked in a lot of places, including Yardbarker's home page (and the top story in Yardbarker's Morning Bark email Monday), AOL Fanhouse, Yahoo Sports' Big League Stew, Hardball Talk, Bleacher Report, Staten Island Live, and a whole slew of other places. Thanks, everyone, for the linkage, and thanks to Ross from NYY Stadium Insider for being the first to break the story of McCarver's insanity, posting videos of what he said. I do think the coverage in the blogosphere had something to do with McCarver having to acknowledge Monday that he was inappropriate. And I've written a followup story on it for The Faster Times about McCarver's non-apology apology. "We've discussed the situation with Tim, and relayed in no uncertain terms that his choice of analogies was inappropriate, which he completely agrees with and regrets using," Bell said. "Given his contrition and flawless 25-year track record, we're comfortable no further action is necessary." The funniest thing about that statement was the notion that McCarver has had a "flawless 25-year track record." What broadcasts are they listening to? Heck, the infamous WWII analogy wasn't even the only dopey thing McCarver said just in that game. He also went on and on about how A.J. Burnett must have cut his hand on a "pie plate" when celebrating Nick Swisher getting the walkoff win the night before. Um, Tim, "pie" is just an expression. A.J. 's just smearing the guys' faces with a towel filled with whipped cream. No real pie is involved.You would think McCarver, Mr. Baseball Expert himself, would know better. I just wish that when contract time comes around, FOX and ESPN wouldn't bother with even hiring national announcers. As I've been saying for years, I would love to just hear one person from each team's broadcast booth. How fun would it be to hear, say, Jerry Remy with Michael Kay? Or Vin Scully with Keith Hernandez? Not only that, but they would be a lot better informed on the teams they cover all year. It just makes sense. One was acting shocked when the Rays attempted two safety squeeze bunts with runners on first and third and no one out in the fifth inning. "Very unusual,'' McCarver said. "I have never seen that." Well, it's something the Rays do all the time. In fact, they have become known for that particular play this season, and McCarver probably should've known that. Still, you could give him a mulligan. He has 30 teams to follow, and he can't be expected to know the nuances of every one. Well, that, and McCarver doesn't seem to do any research on teams beforehand the way he used to - it sounds like he parachutes into other cities without a clue. Not that he's the only guy to do that, but it doesn't make it any better. That's another reason that the local broadcasters idea would make sense. Look, I get that national broadcasts are supposed to appeal to the casual fan, as well as the diehard. But what better way could a casual fan learn about another team than to hear one of the team's regular voices tell them about them? It would be a lot better than all the inaccurate stuff the national guys do! My column chastising Derek Jeter for missing Bob Sheppard's funeral brought out a lot of ticked-off Jeter defenders. Which is what I expected. Anytime I've ever written anything less than 100% laudatory about him, I hear it - bigtime - from readers. It was no different this time. Even my Red Sox fan blogging friend Paul Francis Sullivan of Sully Baseball gave me grief over it, writing,"Yankee fans are throwing Jeter under the bus? This Red Sox fan WON'T HAVE IT!" 1. It was the Thursday after the All-Star Break and they were enjoying their time off. 2. They figured their being present for the tributes to Sheppard at the Stadium would be sufficient. But I haven't really heard many people argue either point. Instead, we've heard about this mystery bus containing Yankee players that may still be stuck in bad traffic at the Meadowbrook Parkway. Or that there must have been some other reason the Yankees skipped it, like it was family only. Wrong. Unlike George Steinbrenner's service, which really was restricted to family-only (Reggie Jackson tried, and failed, to get an invite), there were 900 people at Sheppard's funeral, and that press release I quoted said that members of the Yankees would be at the service. If anything, put it on the ownership. It was, after all, the Boss who flew the entire Yankee team to Canton OH to attend Munson's funeral, whether they would forfeit that evening's game or not. That did not happen here, but to single out a PLAYER, even Jeter, is totally wrong. What was he supposed to do, go AWOL? No, I won't put it on the ownership. The Yankee front office had already rented one bus to take staff to Long Island the funeral. There is no reason Jeter or any other Yankee who wanted to pay his respects couldn't have been on that bus. What else was the team supposed to do - charter a jet to fly those grueling 26 miles between from the Bronx to Baldwin, Long Island? Please. And I don't understand the Jeter AWOL comment. It was a day off. There is no reason he couldn't have been there; his "I didn't know" excuse is just laughable. Yes, 24 other Yankees weren't on that bus either. But I'm singling Jeter out because 1) he's the captain, and doing such things is part of his job (he went to Bobby Murcer's funeral, didn't he? ), and 2) he is the one who has singled himself out by having Bob Sheppard as the only voice able to announce him at Yankee Stadium. I guess the Sheppard family was so offended they had to show their disgust by sending Bob's widow to Yankee Stadium just six days after his death. Let's all just realize that we don't know why there were no Yankees players there. Maybe the family didn't want players there, turning it into a media circus. Reggie Jackson was actually Sheppard's friend (Bob helped him with both his HOF speech and his number retirement speech), and he wasn't there either. Why isn't anyone on his case? Maybe Mary Sheppard decided to show more class than was directed her way. I did notice about how the players made a point of all surrounding her in the introduction, which was nice. As for the captain, so much of Jeter's image is based on being classy. Saying and doing the right things. And being the person who most befits what it means to be a "true Yankee." How many times have we heard criticism of another player prefaced by "Derek Jeter would never do that"? So yeah, it is a big, honking deal when the captain of the team makes an error like this. It is a rare misstep, but it is a misstep, nonetheless. Jeter asked Bob Sheppard to record his announcement knowing that Bob wouldn't be there forever, but wanting his voice to be. Bob Sheppard called it one of the greatest compliments he had ever received. To stop using it now that Bob is gone would completely defeat the purpose of recording it in the first place, and dishonor Sheppard, who died knowing his voice would live on at Yankee Stadium through Derek Jeter. Again, if A-Rod had done the same thing, Yankee fans would not exactly be singing hosannas about him doing so. Because it puts the current announcer in an awkward position, and sets the player apart from everybody else as well. Besides, Jeter isn't going to play forever. When he retires, will the Yankees not only have to keep Sheppard's voice alive, but keep announcing Jeter's name in the lineup each night, just to make sure Sheppard's voice will live on through the captain? Where does it end? Get over it, people. When will you all realize that athletes DO NOT owe us anything. Sure, it would have been nice if some of the players showed up for Mr. Sheppard's funeral. However, it's their call, and their right not to. Guess what! They don't even have to explain their reasons for choosing if they don't want too. To bad! Jeter has been a great player for the organization and has never put himself in a compromising situation. The first second the media can find something even remotely controversial regarding him, all you yahoos come out of the closet throwing your two cents in on the matter. Come on! You can whine all you like about what constitutes "classy," but the truth is those athletes don't give a damn about your opinion. Enjoy the athletes for what they are - entertainment. Stop putting stock into them as role models, and we'll all be a lot happier. But Jeter didn't say "no comment" or "it's none of your business" why he didn't go. He said he "didn't know" about the funeral date, which is a joke. And he deserved to be called on it, especially given him insisting that only Sheppard can introduce him. And, as I noted above, so much of Jeter's image is based on him being classy, and being a great role model - the guy who "has never put himself in a compromising situation." So, when he does something not so great, are we supposed to stick our fingers and say "la la la, I can't hear you" or something? C'mon now. Why are Yankee fans cheering when Hideki Matsui hits a home run against their team? Not exactly the greatest of games last night - the Yankees looked really flat, and Phil Hughes didn't have it. But the thing that ticked me off the most about the loss was hearing Yankee fans cheer the opposition. When Hideki Matsui hit a homer off Chan Ho Park to put the game out of reach for the Bombers, all too many Yankee fans got excited over it. The worst was that female "fan" clad in Yankee gear holding up a sign for Matsui and cheering and bopping around like the Yankees won the World Series or something. Good grief. This isn't the first time this has happened this year - Yankee fans did the same thing in an April Angels-Yankees game, when Matsui hit a homer to put Anaheim ahead. I don't get that at all. It's one thing to give an ex-Yankee like Matsui a round of cheers the first time his name is called out in the lineup. After all, even though Matsui and the Angels were in the Bronx in April, that doesn't mean everybody in the ballpark was there any of those games. But it's an entirely different deal to cheer him every time, and to applaud him when he gets a homer, or even a hit, against your team. Matsui isn't a Yankee any more. I have no reason to cheer his home runs now, especially when they're against the Yanks. Enough with the Matsui worship already. It's like when Billy Crystal wore a Switzerland hat when the Yankees played the Dodgers, because of Joe Torre. Please. To me, it's not a hard decision to root for the Yankees over former Yankees. My team comes first. Johnny Damon was one of my favorite Yankees ever, but if he hits a homer against the Bombers when he returns to the Bronx this summer, I will hold my applause. Look, I'm not saying to boo Matsui. I'm just saying that the silly applause and cheers for his hitting feats against the Yankees need to end. It's annoying. 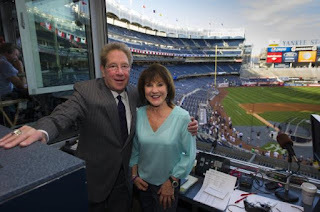 One other thing - didn't hear the game on the radio, so I don't know if John Sterling did the Thrilla by Godzilla call, the way he did this April. Does anybody know? When I bought my Mike Pelfrey shirt to wear to the Subway Series game at Yankee Stadium, Big Pelf was 9-1 with an ERA of 2.39. Since I got my shirt, Pelfrey is 1-4 with a 9.11 ERA. Maybe I need to bury the shirt underneath the new Yankee Stadium, where it all began. Or maybe I can bury it with the Mets' playoff chances, which are rapidly diminishing. I love it how people who have been demanding that the Mets add a pitcher when the rotation was doing well only increase the demand when things start to fall apart. As if trading for a Jake Westbrook is going to make up for Pelfrey's collapse. The Mets' primary pitching need is to figure out what is wrong with Pelfrey. Other organizations have pitching gurus at the major league level as well as in the minors. The Tigers sent down Max Scherzer, Armando Galarraga and Rick Porcello. All have returned with improved results. Dan Warthen must be doing something right, considering how good the starting pitching has been much of the year, but he doesn't seem to have the answers when things go wrong. Unless Pelfrey has an injury, which we'll never knew for sure the way Jerry Manuel continues to be in denial on injuries. Last night, Pelfrey gave up six runs in just 1 2/3 innings. Here's how bad he was - that was a worse start than any of Oliver Perez' this year. On Sunday, I wrote that Ruben Tejada had done the impossible - make Luis Castillo look like an upgrade, at least at the plate. I hope Pelfrey never makes Ollie look like an upgrade, but he has done something almost as impossible - make a potential Ollie start less scary. Ollie can't do any worse than last night's debacle. At least I hope not. Ever since George Steinbrenner passed away, Squawker Lisa has been goading me into admitting that I wish that he had owned the Mets. And over the last few days, I've come close to going over to the dark side. Then I thought about the events of 20 years ago. It's bad enough that Steinbrenner was suspended from baseball not once, but twice, for serious misdeeds that would taint anyone's reputation. But the specific part of the anniversary I am remembering is the reaction of fans at Yankee Stadium when they learned of the Steinbrenner ban. At the time, Steinbrenner was not generally seen as a winner, but as a meddling owner whose bizarre methods were PREVENTING his team from winning. Many of the tributes to Steinbrenner over the last few days have been along the lines of, sure he could be a difficult person, but all he wanted to do was win, and he won more than anyone. But in 1990, the Mets had just as many titles as the Yankees over the previous two decades or so - two. Steinbrenner's Yankees had won the town away from the Mets in the mid-to-late '70s, but the Mets had won it back in the mid-eighties. The Mets won 91 games and finished second. It was the seventh straight year the Mets finished first or second in the NL East. The Yankees won 67 games, finishing seventh and last in the AL East. The Mets drew 2,732,745, while the Yankees' attendance was 2,006,436. The Mets even had a higher payroll than the Yankees, $21,922,834 to $21,312,318. So in 1990, Steinbrenner was seen by many Yankee fans as someone who had won in the past, but was no longer a winner. Kind of like how Squawker Lisa sees Joe Torre today. I watched Ken Burns' "Baseball" a few months ago, and it was strange to see how this documentary, which came out in 1994, dismissed Steinbrenner as someone who had ruined the Yankees. Obviously, the Yankees' and Mets' fortunes diverged dramatically after 1990. And while the Yankee turnaround did not begin until after Steinbrenner was temporarily out of the picture, he was the active owner for all subsequent titles except for 2009. But too many of the tributes to Steinbrenner have justified the earlier, win-at-all-costs-no-matter-much-of-a-jerk-I-am Boss with the overall record, when most of the titles came after Steinbrenner had mellowed at least somewhat. Steinbrenner's baseball people had started putting the pieces together for another dynasty. And once he returned, he held on to those pieces. By 2004, Yankee fans were chanting, "We love George." Of course they did, after four titles and six World Series in the previous eight years. Winning changes everything. But Steinbrenner had also changed. The closest I ever came to stop rooting for one of my teams because of a specific person was when the Knicks got Latrell Sprewell. Then Sprewell didn't choke anyone while in New York and the Knicks went to the finals in 1999, and I was referring to him as Spree. The Isiah Thomas years were kind of like the M. Donald Grant years of the late '70s. You held your nose and waited for them to pass. James Dolan is willing to spend crazy amounts of money to field winning teams. But he's failed miserably and is derided as a buffoon. Imagine if LeBron James had told Jim Gray, "I'm taking my talents to Broadway." The New York media would be hailing LeBron as a winner who was willing to accept the challenge of the biggest stage. And Dolan would be cast in a much different light, as an owner willing to do whatever it takes to win. Most people attacking LeBron and the Miami Heat would be ecstatic if James, Dwyane Wade and Chris Bosh were on their team. So I'm not going to say that I would never have rooted for the Mets if Steinbrenner had owned the team. I'm not a big Woody Johnson fan, and while I do like Rex Ryan, I wish he would tone it down a little bit, but as a frustrated Jet fan, I'm more excited about the team than I have been in years, and it doesn't bother me that in other cities, they are becoming a team to hate. Just as I couldn't care less that other cities didn't like the 1986 Mets. Instead of wishing that Steinbrenner had owned the Mets, I wish that the Mets always had owners who put winning first. Even if the Yankees have more money, the Mets have plenty of money themselves, and the same opportunities in the New York market. But even in 2006, when the team seemed headed to the World Series, the Mets were reluctant at first to eat Kaz Matsui's contract. While the Mets may need Luis Castillo in the short term, it would be great if they were willing to just let him go in the offseason if they came up with a better alternative. I'm not convinced that the Mets should eat Oliver Perez' contract, since anyone with Scott Boras as an agent could be trying to force his way out of town. Imagine if Ollie, still young and with a healthy arm, latched on with Dave Duncan and the Cardinals, or even the Yankees, and reached his great potential, even if briefly. What's really annoying is hearing how the Mets may be willing to take on payroll now, when they were unwilling to pick up that starting pitcher that everyone agreed they needed in the offseason. I'm still angry over how the Mets got rid of Billy Wagner to save a few million dollars, giving up the chance to get two first-round draft choices. Chris Carter is far from an equivalent return. Those draft choices went to Boston instead. Boston is a team that is willing to spend to develop a farm system. The Red Sox have been decimated by injuries this season, but unlike the 2009 Mets, they have had enough pieces in their system to continue to contend. Unlike the Mets, the Red Sox are willing to go over slot to sign draft picks. Even when the Mets draft a Boras client first as they did this year, they generally cut costs with the rest of the draft. If there is anything that would make me wish that someone like Steinbrenner owned the Mets, it's this big-market team being unwilling to go over slot. But in the end, winning forgives everything. There have been times over the last few years when I thought that Omar Minaya, Willie Randolph and Jerry Manuel knew what they were doing. And I praised ownership for doing what it takes to win. So I hope it's not too hypocritical of me to say that, while I'm glad that Steinbrenner did not own the Mets, I would have been happy with his results over the last 37 years. Apparently, a two-run lead isn't enough for Francisco Rodriguez these days. All three of K-Rod's July saves have come in games in which he entered with a lead of at least three runs. In two of them, K-Rod had leads of four runs - he came into the game with men on base. And in one of those, K-Rod gave up a couple of hits to score two runs and cut the lead in half. The Mets won Sunday in extra innings despite K-Rod's latest meltdown, but any discussion of the Mets fighting for the postseason must include the question, do you trust K-Rod in a big spot? Neither do I. So I'm still hoping the Mets don't mortgage their future for a shot in the dark at the playoffs. With Cliff Lee off the market, no difference maker is likely to be available. Roy Oswalt was the next-best pitcher who could be traded, but he left today's game with an injury. With Carlos Beltran back, the Mets' next acquisition looks to be none other than Luis Castillo. Ruben Tejada has done the impossible - he's made Castillo's return to the lineup look like an upgrade. Tejada is now 4 for his last 38, which is a batting average of .108. Actually, Tejada has done two impossible things - as long as he's in the lineup, Rod Barajas is not in the deepest slump, despite going 4 for his last 33, which puts him all the way up to .121. Send Tejada to the minors, let him play every day, and don't trade him for a rental. Tejada isn't untouchable, but at age 20, he certainly has enough upside to eventually replace Omar Minaya's questionable contracts for Castillo and Alex Cora. Also send Josh Thole down so he can play every day. Despite Barajas' slump (he's been useless at the plate since May), it's refreshing to see the Mets put defense first for a change. At least K-Rod hasn't done as much damage as he might have - the Mets have come back to win three of his blown saves. I'm glad I didn't buy that A.J. Burnett #34 t-shirt I had my eye on last year. Because I'm positively irate with the Yankee pitcher (who is one of my favorite players, by the way), after he lost his temper and banged up his hands yesterday in anger. With his self-destructive actions, Burnett has earned himself a spot in the Yankee Idiots' Hall of Shame, in the wing next to Kevin Brown's and Doyle Alexander's and banged-up paws. That's right across from the Carl Pavano Memorial MRI Tube exhibit and the Scott Proctor's Burned Equipment diorama. To add insult to injury, Burnett first lied about it, saying he sustained the lacerations by slipping on the stairs. So much for that excuse. After hitting a batter, giving up a two-run home run to Reid Brignac and making an error in the second inning to fall behind 3-0, Burnett went into the clubhouse and slammed his open hands into a pair of swinging doors. The doors have plastic holders for display of lineups and other team announcements. Burnett apparently cut his hands on the edges of the holders, although he first told trainers he had tripped on some steps and scraped his palms while trying to break his fall. Yes, I know A.J. eventually apologized, and seemed remorseful; he also apologized to his teammates this morning. And hopefully, he won't miss a start out of this. But I'm still ticked off over him acting so stupid - he's got an $82 million contract, but a two-cent brain. Squawker Jon and I had other plans Saturday, so I missed watching Saturday's FOX game live. It's just as well, between A.J. Burnett selfishly hurting himself, and Tim McCarver's insane comments (captured by Ross at NY Stadium Insider) comparing the Yankee front office to Nazi Germany and the old Soviet Union for not having Joe Torre remembered in Yankee Stadium. McCarver's rant about Torre not being mentioned in the Stadium isn't even accurate, by the way - for one thing, Torre's picture is on the 2000 Yankee championship banner in the field level. You remember some of those despotic leaders in World War II, primarily in Russia and Germany, where they used to take those pictures that they had ... taken of former generals who were no longer alive, they had shot 'em. They would airbrush the pictures, and airbrushed the generals out of the pictures. In a sense, that's what the Yankees have done with Joe Torre. They have airbrushed his legacy. I mean, there's no sign of Joe Torre at the stadium. And, that's ridiculous. I don't understand it. No, what's ridiculous is that McCarver would make such ignorant, outrageous comments, that simultaneously prop up Joe Torre as a victim and smear the Yankees front office, and that have no basis in fact. To compare Torre to a victim of Nazis and Soviet Communists is both offensive and absurd. These comments were in such incredibly bad taste, I half-expected McCarver to compare Torre's "The Yankee Years" to "The Diary of Anne Frank" and "The Gulag Archipelago." McCarver has a lot in common with Torre, besides both of them having acrimonious ends to their tenure in Yankeeland. Both used to be very good at their jobs, but then they got complacent and arrogant as their fame and fortune grew. And both felt entitled to do whatever they wanted because of who they were, and thought they could just wing it on their names, without any preparation. Now McCarver thinks that comparing Torre - who became a rich man and a future Hall of Famer thanks to his time as a Yankee - to Nazi and Soviet victims is just peachy. I think McCarver is off his rocker. Let's review - Joe left Yankeeland because of the "insult" of getting a one-year, $5 million contract offer with an additional $3 million in incentives. He signed a contract with the Los Angeles Dodgers for less money than the Yankees offered him. Then he wrote "The Yankee Years" and trashed George Steinbrenner and the Yankee front office. He moved on, and so did the Yankees. But according to McCarver, the team ought to be obsessing about poor Joe every day. Give me a break. Yes, Torre got left out of that Yankee Stadium closing tribute, and he should have been mentioned there. But McCarver didn't even bring that up; instead he focused on stuff that isn't even true. How should the Yankees sufficiently honor Torre right now? Retire his number? Give him a plaque in Monument Park? And does McCarver really think that either thing will happen when 1) he's still an active manager for another team, and 2) he has yet to apologize for biting the hand that fed him for twelve years? Casey Stengel had three more rings than Joe Torre. He didn't get his Yankee number retired until 1970, ten years after he was fired, and five years after he retired from the Mets. He didn't get a plaque in Monument Park until 1976, the year after he died. If Torre didn't write "The Yankee Years," I think the front office would have retired his number after he himself retired from managing. Now, I don't see that happening any time soon. But that's Joe's own fault, not the Yankees. Should Derek Jeter have gone to Bob Sheppard's funeral? There was a whole to-do in the New York media yesterday over no Yankee players attending Bob Sheppard's funeral. I wasn't going to write on it until I saw Derek Jeter's rather lame excuse for not being there - the captain said he "didn't know" when the funeral was! On Thursday at 10:15 a.m., a Liturgy of Remembrance will be celebrated for Bob Sheppard. Members of his family, the Sisters of St. Joseph, The New York Yankees and The New York Giants will remember Mr. Sheppard’s life. ..."I don’t think you have to go to a funeral to honor someone. I think a lot of players have honored him. It’s the reason I’ve walked up to a recording of his voice for the last few years and I’ll continue to do that every time I go to the plate for the rest of my career. But I was not aware. I don’t know how many other players were aware of it." Oh, please. Is it that difficult to read the paper, or ask the Yankee front office when the funeral was? This is just a bad excuse. And if it were given by anybody other than Jeter, he would be getting reamed for it. I've heard the excuse that the players didn't really know Sheppard, which is why none of them were there. That may hold water with guys like Nick Swisher, but Jeter is the one - the only one - who gets to use the Sheppard recording of his voice. There's even a specific one for him talking at the microphone, as we found out last night. Speaking of those recordings, can you imagine what the outcry would be in the media if, say, Alex Rodriguez had had Sheppard record his voice for A-Rod-specific announcements, and used his voice to introduce him every night? We'd hear how self-aggrandizing such a gesture was. We'd hear how he's insulting Paul Olden, the current public address announcer, by not being like everybody else and having his name said by him. But Jeter has the Sheppard recordings - and intends on using them for the rest of his career - and people praise him for the classy gesture. Yes, Derek did a great job at the microphone last night in paying tribute to both Bob Sheppard and George Steinbrenner. But it would have been nice for the captain to have been at Sheppard's funeral as well, or at least to have more of a plausible excuse for not being there other than that he "didn't know" about it. Coming later today - my thoughts on the tribute, and the game. But in the meantime, tell us what you think! I feel bad for Fernando Tatis and wish him well now that he has undergone shoulder surgery and is on the 60-day DL, but the fact remains that almost 1.5 of Omar Minaya's Opening Day roster consisted of players that would not make most major-league teams. It took half a year, but the Mets have finally purged the roster of Tatis, Mike Jacobs, Gary Matthews and Frank Catalanotto. A case could be made that a pennant contender would also not have players like Luis Castillo, Oliver Perez and John Maine, who were not only on the Opening Day roster, but started the season in prominent roles. If the Mets still had their Opening Day roster, and Ike Davis, R.A. Dickey, Hisanori Takahashi and Ruben Tejada were not on the team, they would not have gone 48-40 in the first half. Minaya does deserve credit for finding Dickey and Takahashi. Everyone keeps getting ready to write Dickey off, but last night he kept the Mets in the game against two-time defending Cy Young winner Tim Lincecum. Imagine if Maine or Perez had been pitching instead. Tejada improves the Mets' defense over Castillo, and when he was hitting at least a little, the Mets were winning, going something like 15-5 in the first 20 games Tejada started after Castillo went on the DL. But with Tejada in a deep slump, the nearing return of Castillo may not be the disaster that it appeared to be a couple of weeks ago. But Perez is also nearing a return, which brings up a big difference between last year's Met team and this year's. Last year, the team and fans waited, mostly in vain, for injured players to return. But now that Carlos Beltran is back, most fans and probably the team as well are dreading the return of players like Perez. "I assumed that he was ready to play…I put him in the lineup, and then [Ray Ramirez] came to me and said that there is still a bit of discomfort, even though he feels much improved, and I took him out of the lineup." The Mets went through this last year and nobody lost his job. If Reyes is out any length of time, someone needs to be held accountable. And if Reyes is out, the Mets don't have to worry about trading for some so-so starter who probably won't make an appreciable difference to a team whose big problem now is scoring runs, because the Mets will be out of the race. When Sherman wrote "Birth of a Dynasty," about the 1996 Yankees, he wrote like one of the classic baseball writers, like Red Smith or Roger Kahn. When he writes anything else, he writes like a New York Post employee. And I don't mean Jimmy Cannon, an example of the former, because Cannon died before Rupert Murdoch turned the Post from the people's paper into the crazy people's paper. Are we not supposed to go to a library because it was endowed by Andrew Carnegie, who authorized the cold-blooded murder of unionized employees at his mines and mills? Are we not supposed to go to a museum because it was endowed by John D. Rockefeller, who did the same? Lots of people have done a lot more wrong, and far worse things, than George Steinbrenner did. Most of his wrongs were less "How dare you?" and more "What were you thinking?" We're not talking about Walter O'Malley here. What did he ever do for kids, or sick people, or old acquaintances in trouble? And anything he ever did that helped the game of baseball, he did it first, foremost, and often only because it was going to help himself. Face it, if he thought he could make more money in Japan than in Los Angeles, the Yankees would have played some World Series against the Tokyo Dodgers. George Steinbrenner could have taken the Cornelius Vanderbilt attitude of "The public be damned." Instead, he took the Carnegie attitude of "I have to make amends." Even if we don't like him -- and no one is required to like him -- we should at least respect his willingness to change for the better, and to act on that change. No, he was no saint. But show me one person who ever owned a sports team who was. Life today would be easier to mindlessly accept the myth and ignore decades of reporting that show Steinbrenner was hardly the family man or friend refashioned in recent years. Who wants to write the truth on the day of a man’s death, that Steinbrenner’s life was not all champagne, parades and genius accompanied by the background music of a "Yankeeography?" Oh, please. Nobody out there is saying Steinbrenner was perfect. But there is a big difference between acknowledging his flaws, and making his biography all about those flaws. Besides, most people have the sense to know that it doesn't come off very well to talk too poorly about the deceased on the day that they died. Heck, even Michael Jackson got a pass on such matters right after he passed away. And Sherman, of all people, complaining about perspective? This is the guy who wrote after 2009's Opening Day that CC Sabathia and Mark Teixeria got "money for nothing." Who suggested that the 2009 World Series feels "over" because the Yankees lost Game 1. And who, in a time of two wars and double-digit unemployment, complained about Joe Torre's "plight" with the Dodgers. Now he's going to lecture the rest of us on how to feel about Steinbrenner? C'mon now. Yes, he would often — with the passing of time — try to ameliorate heartlessness with charity, as if that made the balance sheet even in the human-being department. He used his checkbook to make the Yankees a powerhouse and to try to get into heaven by correcting wrongs. Give me a break. Is the Post writer not just a baseball columnist, but a theologian, too? Steinbrenner did many good things for thousands of people over the years - make that decades. It's obnoxious that Sherman not just discounts that, but questions his reasons for doing so. And it's funny how Joel is lecturing the rest of us about having a one-sided portrayal of The Boss, but his perspective of Steinbrenner is just as one-sided, in the opposite way. George was a complicated man, with many sides to him, but Sherman is the one who wants to ignore all the good in him, and insinuate that even his most charitable efforts had an ulterior motive. How insulting. "As Steinbrenner completed a cycle from character to caricature to ghost, his family and the organization used his public silence to go into rewrite: To turn his twilight reputation into benevolent elder statesman. And to whitewash a past of cruelty, bluster and rule-breaking. The Yankees owner was a winner, instead, and winners sometimes commit minor transgressions in order to win." However, the transgressions were often far from minor, unless — for example — owning the record for being thrown out of your sport (twice) is minor. That's not what happened at all. Sherman is the one who's being the myth-maker here, wanting us to believe that Steinbrenner stayed the same as he was in 1978, and it was only his minions who changed his reputation. Did he even pay attention to anything The Boss did from the mid-1990s on? Because we could see with our own eyes that Steinbrenner had mellowed. Had made amends for his wrongdoing. Had even learned a little from his mistakes. Remember how fans serenaded Steinbrenner with the "Thank you, George" and "We love you, George" chants on 2004's Opening Day? That wasn't the family rewriting his reputation - it was fans seeing on their own what Steinbrenner had done for them - and appreciating him for it. And contrary to Sherman's opinion, I don't think The Boss' minions had anything to do with all the people coming forward now with stories about how good Steinbrenner was to them. It's just the opposite - time after time, we read, like in Sherman's own New York Post, about how George would do something kind for somebody, and ask them to keep it quiet. Maybe the worst thing about Sherman's piece is that he's so self-righteous in spitting on Steinbrenner's grave, claiming "it is more disrespectful now to Steinbrenner’s legacy to offer a sanitized version of his story." Spare me the sanctimony, dude. What the heck was Joe Girardi thinking in leaving A-Rod on the bench? I am still irate over the end of the All-Star Game last night. Thanks for nothing, Joe Girardi. And for once, Squawker Jon and I are in agreement on something - Alex Rodriguez should have been in the game last night. I wrote on Facebook in the ninth inning that if A-Rod were given the opportunity to do so, he would tie or win the game. For the Boss, of course. And I'm furious that Rodriguez never got the opportunity to make history. Think about this for a second - you can bring the tying run to the plate with A-Rod. It's also the day George Steinbrenner died. You mean to tell me Alex, known for his flair for the dramatic, wouldn't have had a big moment if he were given the opportunity? C'mon now. What the heck was Girardi thinking? As Squawker Jon noted, A-Rod only started the four-run rally against Jonathan Broxton last month. Why not bring in Alex to remind Broxton of that worst outing of his career? Asked for a particular reason he did not put Rodriguez in the game, Girardi said there was no injury-related concern with A-Rod, but rather with Beltre's left hamstring, which nearly prompted the Rangers' Michael Young to be added Monday as a replacement. "We were talking about pinch-running [Rodriguez] in a situation," Girardi said. "We also had a little issue with Beltre and we were concerned about his hamstring, so if we get the tying run on, Al was going to pinch-run and then go in [to play third base]." What the???? (Smacks forehead.) You're going to use A-Rod as a PINCH RUNNER to replace a gimpy Adrian Beltre? Are you freaking kidding me? Good grief. No wonder A-Rod looked so ticked off at the end of the game! Yeah, if the Boss were in his prime, I think Girardi's head would have been on the chopping block - or he would have at least been the object of Steinbrenner's rage. And with good reason. Girardi not playing A-Rod isn't as bad as Torre batting him eighth, but it's still a huge misstep. What a nightmare. George Steinbrenner fired Billy Martin less than a year after Martin managed the Yankees to their first World Series win in 15 years, back in 1977. One of the things that Steinbrenner and Martin clashed over was how to use Reggie Jackson. So what would the Steinbrenner of those days have said about Joe Girardi managing the AL to its first All-Star Game loss in 14 years, blowing home-field advantage for the Yankees if they get to the World Series, with Alex Rodriguez on the bench? Squawker Lisa and I agreed that Girardi was saving A-Rod for a key moment in the ninth. We both predicted a homer - I just hoped it would be with none on. But then David Ortiz singled to start the bottom of the ninth. And Girardi, even with the huge All-Star rosters, had no pinch-runner for Ortiz, whose poor baserunning got him thrown out at second on a bloop hit by John Buck. It came down to two outs, one on, and Ian Kinsler at the plate. Kinsler has been hot lately and is now batting .310, but he only has four homers and 30 RBI in 239 at-bats. A-Rod is hitting .269, but he has 14 homers and 70 RBI. After the game, NL manager Charlie Manuel said of A-Rod, "I was definitely looking for him. You know, he's one of the better hitters in the game, if not the best." Manuel was smiling and even laughed as he said this. Joe Girardi said after the game that he was out of outfielders and if the game had gone into extra innings, A-Rod would probably have been the DH. That's fine, Joe, but you've got to get to extra innings first. The last time A-Rod faced Jonathan Broxton, he singled to spark the Yankees' four-run ninth against the Dodgers on June 27. The previous night, Broxton walked A-Rod. These are the only two times A-Rod has faced Broxton. So Broxton has never gotten A-Rod out, and the last time they faced each other, A-Rod started the rally that resulted in one of the worst blown saves of Broxton's career. This happened only two weeks ago. And it happened on national TV - the ESPN Sunday night game. Wouldn't you think Girardi would want to make sure that A-Rod faced Broxton one more time? A-Rod looked annoyed after the game when he was show in the dugout talking animatedly to Robinson Cano. Phil Hughes was probably not too pleased when he was pulled in his hometown after getting only one out and had to watch helplessly as Matt Thornton gave up the bases-clearing double to Brian McCann - saddling Hughes with the loss. Girardi still has one more ring than Jerry Manuel is likely ever to have. But tonight, Girardi ended up making moves I might expect more from Manuel. It's unthinkable today that Girardi could lose his job after winning a title just last November. But in 1978, Steinbrenner fired Martin in July after winning the title the previous fall. A few days later, Martin was introduced at Old Timers' Day as the new Yankee manager - for 1980. The Yankees' 2010 Old Timers' Day is this Saturday. It should be a memorable day after all that has happened this week with the loss of both Steinbrenner and Bob Sheppard. Fortunately for Girardi, his own status does not figure to be part of the story this time around. I am going to be on Albany's Soundoff With Sinkoff at 6 p.m. to talk about the life of George Steinbrenner. Host Brian Sinkoff's show is on WTMM, 104.5 The Team - you can listen live if you're in the Albany area, or click the listen live button here to hear me online. Jeff Idelson - former Yankees PR director, and current president of the Baseball Hall of Fame is on now. John Sterling should be on around 4:30 p.m. Tommy John will be on at 5, and I'll be on at 6 p.m. Pretty cool! Shocker: Red Sox owner John W. Henry sez George Steinbrenner belongs in the Hall of Fame! "I had the good fortune to call George Steinbrenner both partner and friend. I had the privilege to watch George as he built a system that ensured his beloved Yankees would have a strong foundation for sustained excellence. And then we fiercely competed in the American League. George Steinbrenner forever changed baseball and hopefully some day we will see him honored in baseball's Hall of Fame as one of the great figures in the history of sports." "He had a giant heart, often well hidden from public view. Part of his legacy here in Boston will be the profound kindness he showed to numerous local philanthropic causes, especially as a regular and generous contributor each year to the Jimmy Fund of the Dana Farber Cancer Institute." Team chairman Tom Werner said that "baseball's greatest rivalry will not be the same without him." Werner said he "knew George as a competitor and today Red Sox Nation lost a person who truly relished the prospect of facing the Red Sox and doing all he could to make sure his beloved Yankees would come out victorious." To top it all off, the Red Sox will observe a moment of silence in Steinbrenner's honor before Thursday night's Fenway Park game against the Texas Rangers. That might be the most shocking news of all! New York Yankees owner George Steinbrenner died this morning at the age of 80. I knew this day would come soon, but it doesn't make it any less sad. Steinbrenner was literally the only Yankee owner I remember. If Bomber announcer Bob Sheppard, who died just two days ago, was the Voice of the Yankees, The Boss was the team's heart and soul. And having Steinbrenner, who had such a larger-than-life person, in charge of the team I rooted for helped shape the way I view sports. I grew up reading the New York tabloids, but I didn't know enough at that age to realize that the Boss/Billy/Reggie squabbles I read about every day were not exactly normal for baseball. But what I did get from that was how much Steinbrenner cared about the Yankees - and about winning. Unlike owners who are content to just use teams as cash cows, George was all about the rings, even if it meant that spending extra on the players - both on salaries and amenties - might take away a little from the bottom line. "This is the people's team. The desire to win was instilled on me by the people, like those people out there." It's gut-wrenching to think of the later years in Steinbrenner's life, with all the health problems, and what he and his family went through. My late father had similar health issues, so it really rings home to me. When my dad died, it was hard to take, but he hadn't been himself for several years. The last time I saw him alive, lying in a hospital bed in my parents' home, the ravages of aging on his brain were so bad that he literally did not know who I was. But when my dad died, I could remember the good times, and what he once was, and not just remember those sad days in the twilight of his life. I hope people remember the good times with George Steinbrenner today. The owner who would cry tears of joy when his team won the World Series. The man who was willing to give troubled players like Darryl Strawberry and Dwight Gooden second chances. And the generous - and often anonymous - benefactor of countless charitable endeavors. Yes, I know The Boss wasn't perfect. But there's a time and place to talk about that, and today isn't it. Today, I just want to say, "Thank you, George" for making the Yankees great again. And again. The New York Post's Joel Sherman is reporting this morning that the Yankees are "on the brink of obtaining Cliff Lee late last night for a package that would include top prospect Jesus Montero." Let me stand up now and shout "Noooooooooooooooooo!" to such a deal. Don't get me wrong; I think Cliff Lee would look pretty nifty in pinstripes next year. But it makes little sense to trade for him now. Especially when it will end up costing the Yankees their top prospect - and some other prospects as well. For what, a three-month rental? Please. How did it work out for the Yankees with Austin Jackson, the last time the Yankees traded a top prospect? Anyhow, last time I checked, Jorge Posada wasn't getting any younger. And as much as I love Francisco Cervelli, he's not going to be a superstar. But supposedly, Montero has that capability - it's why some Yankee fans didn't want Joe Mauer to come to the Bronx, because Montero was the catcher of the future. And now there's a good chance he'll be moved for somebody the Yankees could just sign for this winter anyway. How does this deal make any sense? If there is any flaw with this Yankees' team, it's the bullpen, not the starting rotation. How will getting Lee fix that? And last year, the Yankees were able to win the World Series last year with a three-man rotation. Right now, they have CC Sabathia, Andy Pettitte, A.J. Burnett, Phil Hughes, and Javier Vazquez. Even if they could get Lee for nothing, which they won't, where would they put him - or put the odd man out? Vazquez makes nine million this season - who's going to take on that salary without the Yankees picking up most of it? A.J. 's $82 million, five-year contract makes him untradeable. And pitching innings limits aside, is it wise to mess with Phil Hughes and bump him to the bullpen again? Anyhow, I hope this supposed deal is just a rumor. Cashman didn't go after CC Sabathia in the trade market, figuring the Yankees could sign him as a free agent. Why not have the same policy with Lee, especially when such a trade could have repurcussions for many years? Please, Cash, just say no to Cliff Lee - for 2010, at least. LeBron James: The new A-Rod? Let me indulge in a little basketball banter this morning, with my thoughts on the whole LeBron James saga. Yes, I'm glad LeBron James isn't going to the Knicks. And I'm also glad that King James is about to take the most despised sports superstar title away from Alex Rodriguez (who really should have gotten that dubious crown lifted from him after the Yankees won the 2009 World Series.) Because the way LeBron handled The Decision - with an hour-long nationally televised dog-and-pony show - made A-Rod opting out during Game 4 of the 2007 World Series look positively restrained. Look, I'm not going to be a hypocrite and chastise LeBron for leaving Cleveland and heading to to the Miami Heat - or "South Beach," as he called it. After all, I root for the New York Yankees, a team loaded with free agents who did just what he did. And James is taking less money to be with a franchise where he thinks he's got a better chance of winning it all. Kind of like how A-Rod was willing to take less money to get out of Texas, and how he gave up the chance to be the greatest shortstop of all time by going to the Yankees and deferring to Derek Jeter. But LeBron had better win - right away - or he's going to get the same reputation as a postseason choker that A-Rod did for so long with the Yankees. I saw a lot of talk on Facebook and Twitter last night about how the Miami Heat is Dwyane Wade's team, the way many Yankee fans said when A-Rod came to New York that the Bombers were Jeter's team. Although James and Wade (and Chris Bosh) are all friends - apparently they cooked up this scheme to play together back in the 2008 Olympics (reminds me of the rumors that Andy Pettitte and Roger Clemens planned going to the Houston Astros months ahead of time), Wade already has his ring. And if the Heat falter in the playoffs, James, not Wade, is the one who is going to get the, um, heat over it. Frankly, given James' failure in the postseason, capped by this year's debacle against the Celtics, I'm surprised he doesn't already have more of a rep as somebody who can't hack it in the playoffs. Or as a very poor sport - I lost a lot of respect for him when he refused to shake hands after losing in the postseason. LeBron has put as big a target on his back as A-Rod did with his $252 million contract with the Texas Rangers. People forget that A-Rod's rep was squeaky clean - and he was a beloved figure - when he was with Seattle. But when he left the Mariners at age 25 (the same age LeBron is now), A-Rod's reputation took a huge hit, and it never really recovered. Heck, they're still throwing fake dollar bills at him in Seattle, as they did just last night! I don't think there was any easy way LeBron could have left Cleveland. But I also think he couldn't have handled it much worse, from having the six contending teams kiss his ring, to not giving the Cavs a heads-up to his plans, to making his decision a nationally televised debacle. ESPN's Stuart Scott is defending what LeBron did, saying they were giving money to charity with the broadcast. So what, who cares, as Joy Behar would say. I loved that Cavaliers owner Dan Gilbert issued such an over-the-top, furious statement last night, calling James a narcissist and a coward. It was like something George Steinbrenner would have done back in the day, showing as much passion for the team as the fans do. Give me anger like that anyday over some mealy-mouthed corporate statement issued by some PR drone. And I don't exactly feel sorry for the Knicks. My worst fear about the Yankees is that the Steinbrenner kids one day sell the team to the Dolans. What kind of sport is basketball, that you can essentially tank two seasons (yet still sell your tickets at full price), and cheat your fans out of good basketball, just to clear some cap space? Oh, and how about the Knicks' "closer"? You bring in Isiah Thomas, the person who single-handed killed a 50-year-old basketball league, and who helped destroy your franchise, to get the job done? Unbelievable. Yes, I am loving that LeBron James is not coming to New York. After all the Get LeBron and C'mon LeBron nonsense, after all the tabloid journalists acting like cheerleaders to get him on the Knicks, and the expectation that him coming to New York was inevitable, I'm loving that the city's mediots got their LeBron pom-poms knocked out of their hands. At any rate, I think the person happiest about this whole LeBron thing is A-Rod. Now James, not Rodriguez, will be sports' punching bag pinata when it comes to complaining about athletes. Alex has to be relieved. Who will get your All-Star Final Vote? I've been busy voting - and voting and voting - for Nick Swisher in the AL All-Star Final Vote campaign. I also wrote a piece for The Faster Times about the battle between him and Kevin Youkilis for the spot. But I'm wondering who Yankee fans are throwing their National League vote to. I would have voted for Joey Votto - he got robbed of a spot on the All-Star team in the first place - but then he had to form an evil alliance with Youk. So that's out. So I decided to make my NL vote all about ticking off Squawker Jon. Initially, I voted for ex-Met Billy Wagner. The fact that the Mets lost two draft picks by trading him is something that still ticks Jon off. But then I thought I should also throw some votes Heath Bell's way, given that the Mets essentially traded him for a bag of balls, and he's turned out to be a great closer for the San Diego Padres. Now that Bell has been named to the team as an injury replacement, maybe Jon will have to deal with both Wagner and Bell as All-Stars! My votes are all about getting Jon irate. Ever wonder why Met-killer Yadier Molina wins the catcher vote every year for the All-Star Game? It's my fault! Who is Jon voting for on his Final Vote ballot? I dunno, but I heard he's going to announce it tonight in a prime-time special. Where do you think LeBron James got the idea? Who are you voting for? Tell us about it! The real reason Jerry Manuel visited Johan Santana on the mound in the ninth? Santana's been on the Mets for 2 1/2 years and has built a reputation as someone as competitive as anyone else on the team. And Manuel still felt the need to ask him how he felt? What did he expect Santana to say - "Better take me out, Skip. K-Rod needs his regular work"? Manuel even admitted after the game that he would have been that much more reluctant to remove Santana since the last batter had reached on an error (by Jason Bay). So why did Manuel bother to come out to the mound? Was he just messing with the crowd, getting them to boo when he approached the mound, then cheer when he left Johan in? Or was Manuel starting to do his usual managing by the book, but resisting the urge to make the usual knee-jerk decision and making the right move for this game? After Bay's error, Johnny Gomes was coming up as the tying run. Following Gomes was Drew Stubbs. Two righty hitters with power. Stubbs had just hit three homers in a game on Sunday. Going by the book would mean taking out Santana and bringing in your righty closer. Fortunately for Santana and the Mets, Manuel threw away the book in the ninth inning last night. On June 21, I wrote that it was "Way too soon to bury Johan Santana." Santana had one more lousy start after that, then has allowed only one run in 16 innings over his last two starts. I'm glad to see that Santana is looking like he can pull off one of his second-half surges. But June 21 was also just after I wore my new Mike Pelfrey shirt to his game at Yankee Stadium. Back then, Pelfrey was looking like the ace of the staff and a sure All-Star, with an ERA of 2.39. Now that ERA is exactly one run higher at 3.39. Squawker Lisa wore an "In Joba We Trust" shirt to that game, and Chamberlain has been struggling as well. Could it be that our Subway Series shirts are cursed? What do you think, Lisa, should we bury our shirts at Yankee Stadium next to the David Ortiz jersey? I'm going to be on South Florida radio this afternoon with Larry Milian - aka the Amigo. I should be on at 3:20 p.m. today, and we'll be squawking Yankees. If you live in the Miami/Fort Lauderdale area, turn on 640 on your AM dial. Or you can hear me online by going to the WFTL Sports website and hitting the "listen live" button.